I thought I would start this blog with the very first headpiece I created about two years ago. I honestly just wanted something unique to do a photo shoot with. Sometimes it's hard to find intriguing fashion pieces, especially in Colorado. Never the less it was a beautiful spring in Colorado that year and as I was off work from the ships and easily bored, I needed a project. What better place to go than Michaels! They had received a beautiful shipment of fake flowers for spring and it instantly caught my eye. Now how I decided on twisting wire I have no clue... probably because I've done a lot of sewing in my fashion creation days and felt at the time it would take less patience. Wrong. Definitely wrong about the patience thing, but the wire added a unique texture and method I haven't really seen. Besides getting smacked by flailing wire or pricked by sharp ends, the process was actually fun and i found it intriguing how the wire kind of led me into a design instead of having something concrete in my head already. Attaching the flowers was a struggle but again it was so refreshing to make my own process. 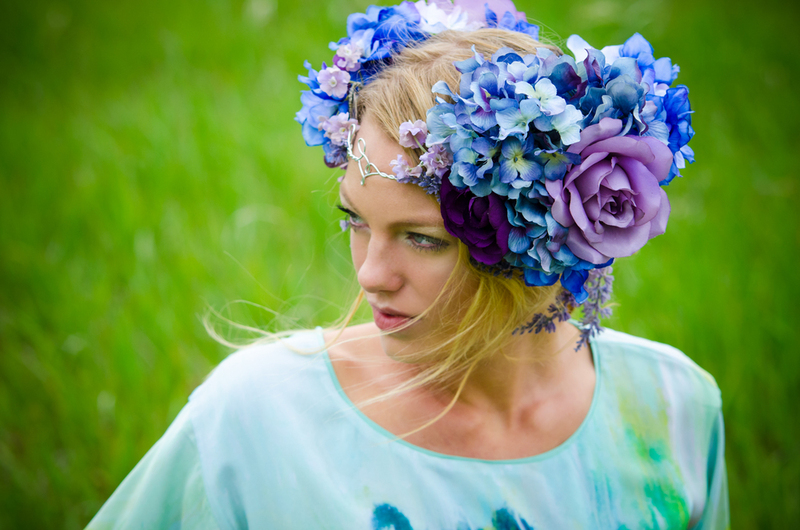 Here's a few shots from an editorial I shot with my first headpiece "Lavender Blue". It is still available for purchase, just contact me if you are interested!